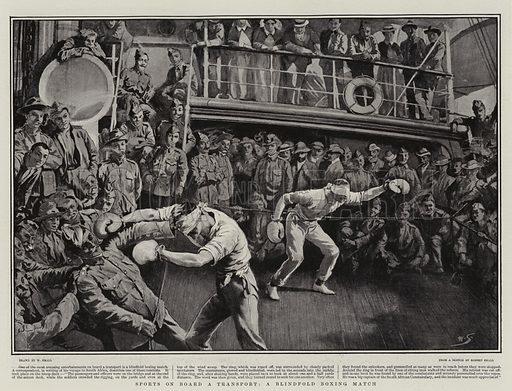 The first picture shows sport on a troop transport ship. 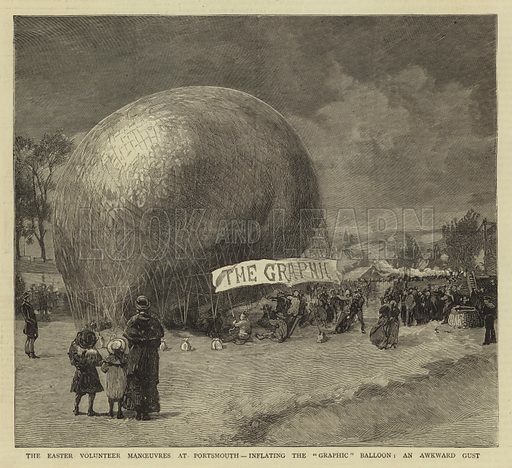 The second picture shows the Graphic artists’ balloon from which they made their drawings. 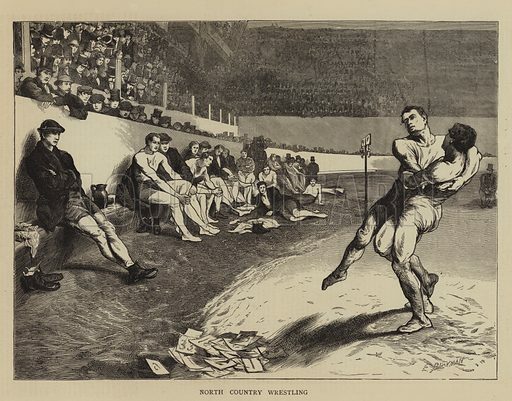 The third picture shows wrestlers at a sporting event in the North. The best pictures of the Emperor Commodus are striking images of this athletic gladiatorial imperator whose life ended in debauchery and assassination. The first picture shows enemies watching this vain emperor whose father and grandfather had also been emperors. The second picture shows drunken hangers-on at his villa. 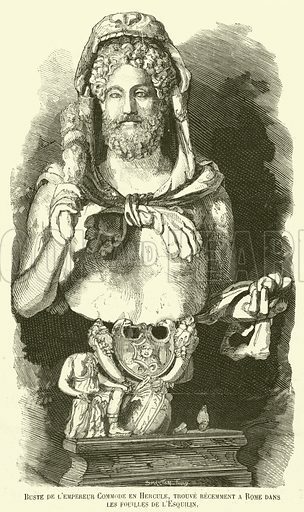 The third picture shows an extravagant Roman baroque bust of Commodus as Hercules. 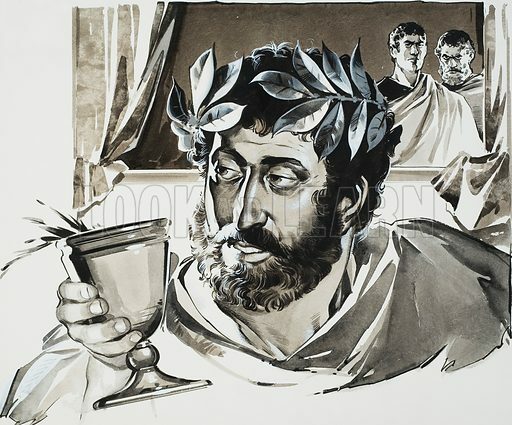 Many more pictures of Roman emperors can be found at the Look and Learn picture library. 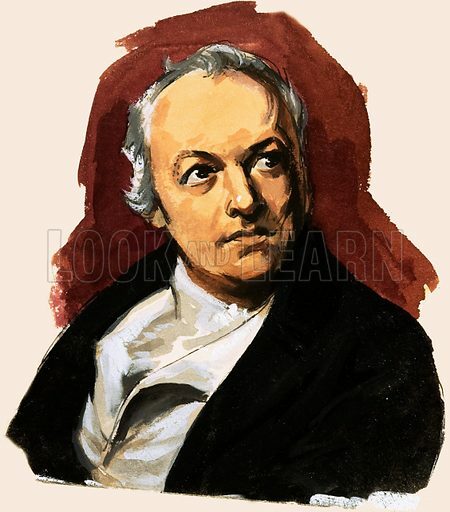 The best pictures of William Blake are images of the poet and his work. The first picture is a portrait of Blake. The second picture shows a decorated page from one of his books. 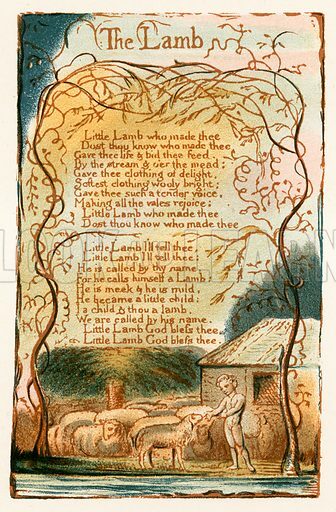 A page from "Songs of Innocence"
The third picture shows an engraving by Blake for a book translated by Mary Wollstonecraft. 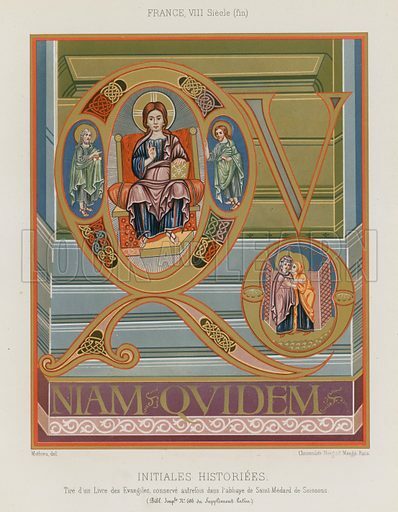 The best pictures of illuminated initials are elaborate artistic creations taken from manuscripts dating from as early as the Twelfth century. 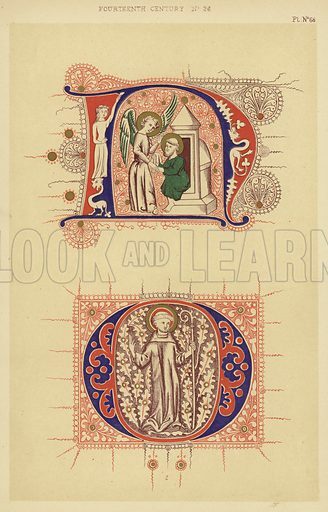 The first picture shows an initial based on an example from the Fourteenth century. The second picture shows historiated initials from an Eighth-century manuscript. The third picture shows two initials based on examples from the Fourteenth century. 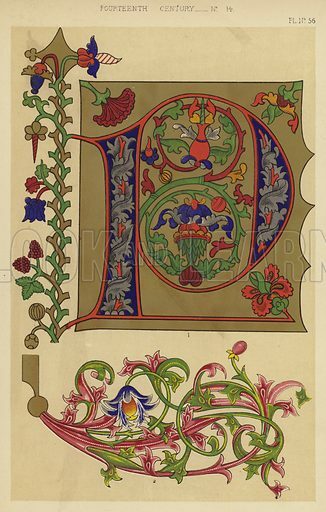 Many more pictures of lettering can be found at the Look and Learn picture library. 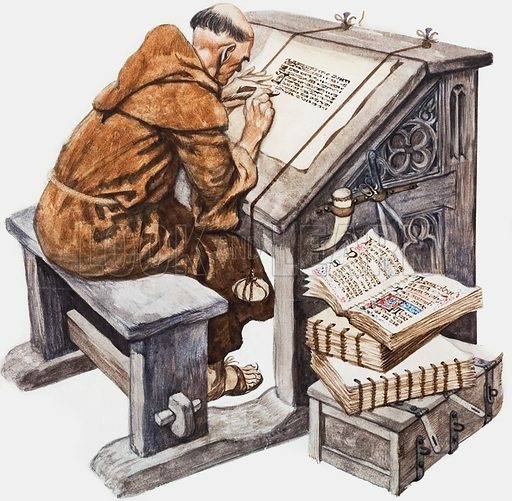 The best pictures of a monastic scriptorium show the monks at work on their elaborate and painstaking artistry. 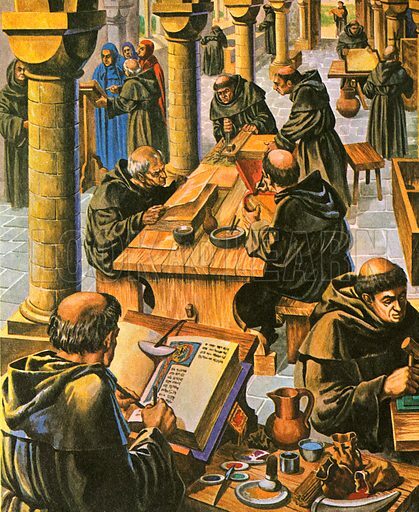 The first picture shows a group of monks in the scriptorium. 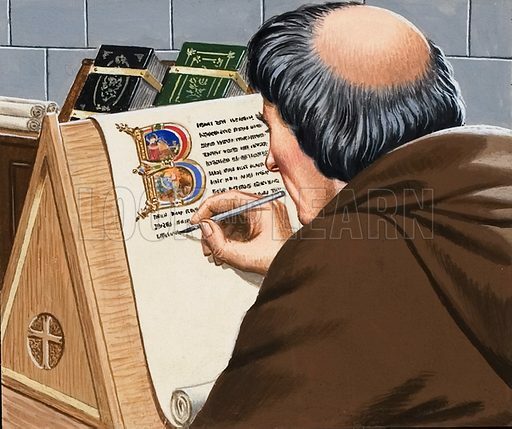 The second picture shows a closer view of a monk at work on his vellum manuscript. The third picture shows a monk at his desk. Many more pictures of monastic life can be found at the Look and Learn picture library. The best cartoons by James Gillray of the easily caricatured Charles James Fox are all superb examples of the artist’s unique draughtsmanship and satirical imagination. 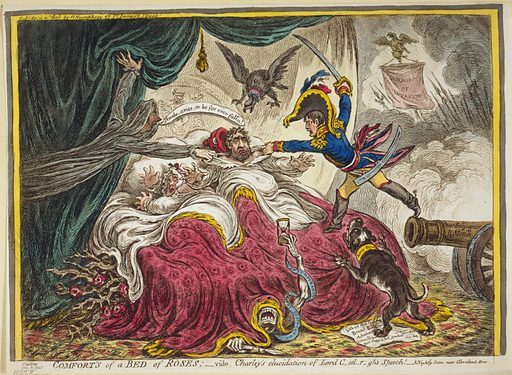 The first Gillray cartoon shows Fox having a nightmare about the horrors of a Napoleonic invasion of Great Britain with Pitt urging him to wake. The second cartoon shows Fox fleeing the Commons with two Opposition allies, Charles Grey (greyhound) and a diminutive M.A.Taylor (piglet), as Pitt reads out a list of triumphs to Fox’s great irritation and embarrassment. In fact Fox had temporarily exiled himself from the Commons, and in 1798 been dismissed from the Privy Council. 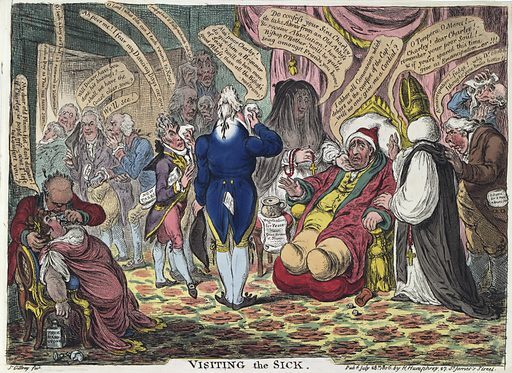 The third cartoon shows a visibly ailing Fox being ministered to by a bevy of comic Catholics, to the amusement of the Prince of Wales, as a fierce satire on Fox’s support for Catholic Emancipation. Many more pictures of cartoons can be found at the Look and Learn picture library. This edited article about British art first appeared in Look and Learn issue number 562 published on 21 October 1972. France was first in the field of social and political magazine journalism, with the magazines, “La Caricature” and “Le Charivari.” Britain was quick to seize upon a good thing. “Punch, or the London Charivari” was born in 1841, and was directly inspired, as its sub-title suggests, by the French satirical weekly. In fact, however, “Punch” was predated by the “Monthly Sheet of Caricatures,” a lithographed journal put out by publisher Thomas McLean as early as 1830. John Doyle was the best of McLean’s artists, a statement which says much for the decline of the British political and satirical cartoon since the heady days of Gillray and of Cruikshank. John Doyle was a dull portrait painter who turned to producing dull cartoons of the statesmen of his day, in situations that made trite and stuffy comment on some political happening or other. It was a long cry from the acid pens of the great caricaturists of yesteryear. By the mid-19th century and the coming of “Punch,” wood-engraving had begun to take over from copper-plate etching as a means of large-scale graphic reproduction. 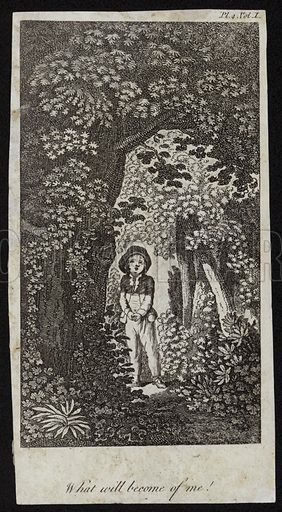 Cruikshank’s cartoons were worked directly on to the copper plate by the artist himself. But not every draughtsman had this special skill. Moreover, printing from a block is altogether cheaper than printing from an etching; so it was that a whole generation of new craftsmen appeared; professional wood-engravers, who did nothing but transfer other men’s drawings onto engraved blocks of wood for printing. Some of these engravers were good (one of the best was Edward Whymper, the first man to climb the Matterhorn), and some were not so good. The difference between the good and the not so good accounts for the flat, dull and “wooden” appearance of so much of the graphic work of the period. Thumb through any illustrated book or magazine of the period, and you will see it for yourself. 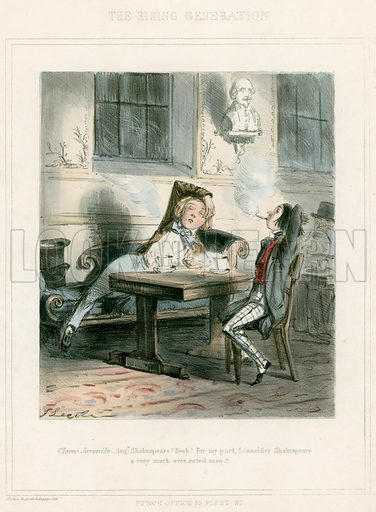 John Leech was a caricaturist in the great tradition; indeed he collaborated with George Cruikshank at one stage, and his style of drawing and choice of subjects greatly resembled those of the older artist. It was Leech who first applied the word “cartoon” in its modern meaning, and it happened this way. In 1843, there was a big exhibition of designs submitted for the frescoes to be painted on the walls of the new Houses of Parliament, and these were correctly called “cartoons,” as finished working drawings had been so-called since the days of the Old Italian masters. Finding most of the Houses of Parliament cartoons to be pretentious and ludicrous, Leech satirised them in a series of “cartoons” of his own. The name stuck, and remains stuck to this day, to this particular type of work. Though he never attempted the grotesque excesses of Gillray, nor the near-criminal libellings of Cruikshank during his period with “The Scourge,” John Leech was a caricaturist who believed in giving his subjects a rough ride. He attacked the Prime Minister, Lord Russell, for his handling of the Ecclesiastical Titles Bill, in a cartoon that was said to have contributed to Russell’s subsequent fall from power. He reserved his strongest venom, however, for foreigners, especially the French. He attacked Louis Napoleon on many occasions. Thanks largely to his efforts, “Punch” was twice banned from France. This edited article about British art first appeared in Look and Learn issue number 560 published on 7 October 1972. Ridicule is a powerful weapon. James Gillray discovered this when he followed William Hogarth as a major British cartoonist. The period which came after them was one of the richest and liveliest in the history of caricature. 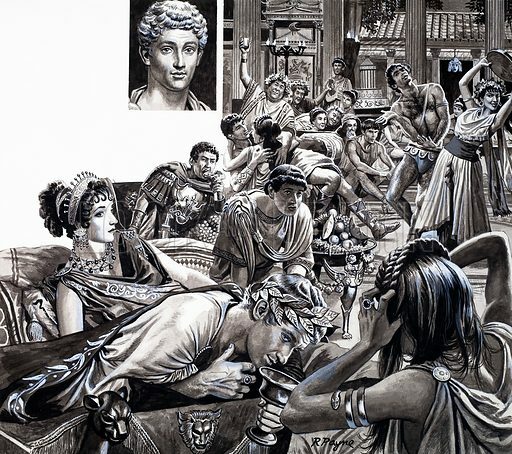 Like all important epochs, the period was memorable for a very large number – about fifty or sixty – of very competent practitioners, and one or two giants who bestrode all the rest like giants. And the two giants who followed after poor James Gillray were Thomas Rowlandson and George Cruikshank. Thomas Rowlandson was the son of a London merchant. He had a straightforward art education at the Royal Academy and in Paris. With the kind of talent he had for recording the English landscape, young Tom might well have been remembered alongside Gainsborough and Constable. But, as in so many cases, including the case of Hogarth, he turned to commercial draughtsmanship to keep himself fed and clothed. Also to support his passion for gambling, which was nearly his ruination. 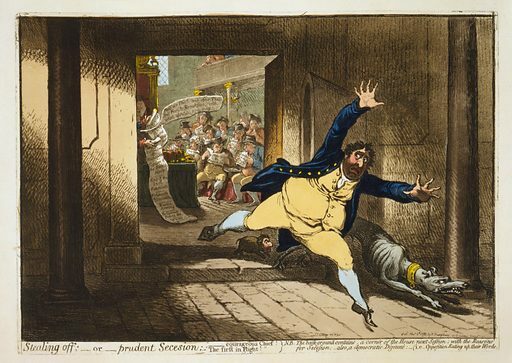 In his political cartoons, he consciously aped the style and bite of Gillray; but, unlike the earlier master, he was not a politically-minded person; he was an observer of the passing scene of life about him, and this he recorded with honesty and affection. Do not look to Rowlandson for an insight into the obscure and involved political set-ups of the late eighteenth century; but, rather, for a pictorial journalist’s view of the rollicking life of the taverns and the docks, and in dance halls and pleasure gardens. His pen dealt with a wide cast of people, particularly women, whom he loved dearly: all kinds of women, from overblown fishwives, to delicate misses in crinolines. He drew them all, even at their most outrageous, without any venom. He had a masterly eye for a crowd scene. He would have made a splendid film director. 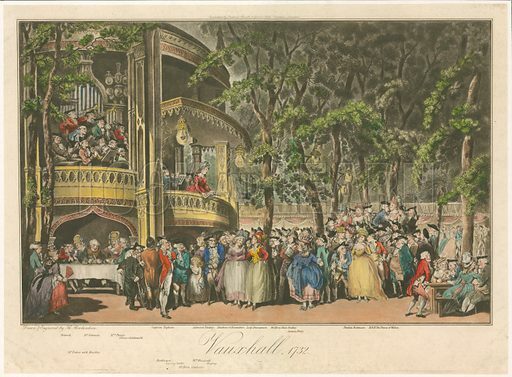 This shows best in his large drawings of processions, and in his coloured drawing of an evening entertainment in Vauxhali gardens – surely his tour de force. This edited article about John Audubon originally appeared in Look and Learn issue number 277 published on 6 May 1967. With a sketch pad on his knees, the artist sat on a fallen log and began drawing. He wore the fringed buckskins of a North American backwoodsman, and his possessions, including his painting materials, were in a pack beside him. For days he had been tramping through endless forest which had only previously been explored by wandering Redskins. Now he felt he was being rewarded for the hardships he had undergone as his pencil point deftly outlined a bird which he had never set eyes on before. A keen love of nature, an ability to paint and a determination never to give up were the qualities which made John Audubon one of the greatest wildlife artists the world has ever known. 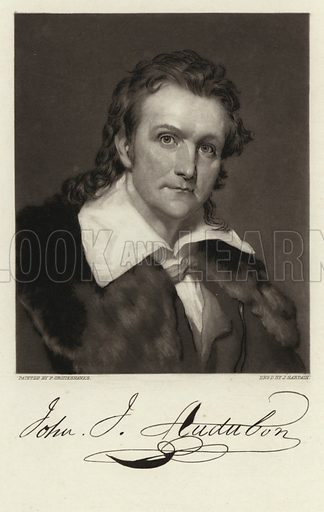 The son of a French naval officer, John Audubon was born at Mandeville in Louisiana, USA, on 5th May, 1780. Because of his father’s nationality, he was sent to Paris for his education. Here he realised that he wished to become an artist and he began to study painting under the most famous artist of the day, J. L. David, who specialised in vast pictures of historical subjects. Money was short, and after a while John had to give up his studies and return to America, where he was forced to become a farmer. It was a far cry from David’s fashionable studio to Pennsylvania, where the would-be artist was trying to eke out a living. But his desire to paint remained. If John could not work on huge canvasses, at least he could still draw on small sketch pads. And if he could not afford to hire beautifully costumed models, at least he could draw the birds which he saw every day round his farm. And so John Audubon’s true career began. It became his ambition to make a picture record of all the birds of North America. Leaving his farm for weeks on end, he would search the trackless forests for new specimens to draw. Years went by and the collection of beautifully tinted drawings grew. Because of neglect, the artist’s farm did not do very well, and sometimes the Audubon family had very little to eat. Yet John’s wife never complained because her husband was less efficient than the other farmers of the district. She knew him to be an exceptional artist and she believed that one day the world would recognise him as such. In 1826, the unknown farmer from Pennsylvania scraped up enough money for a one-way fare to England and took with him his collection of bird pictures. People in Britain who saw his sketches were enthusiastic, so when Audubon returned home, he began putting his great work together. When his Birds of America was finally published, it contained 435 coloured plates and 1055 life-size figures of birds. The work caused a sensation throughout the publishing world, and today these volumes are very valuable. With this success behind him, Audubon went on to his second book, Quadrupeds of North America, in which he was helped by his sons, who seemed to have inherited his flair for nature drawing. This book was published three years after his death, which occurred on 27th January, 1851. This edited article about Kate Greenaway originally appeared in Look and Learn issue number 270 published on 18 March 1967. “What are you doing up so early?” the man asked as a small girl tiptoed into the kitchen. Outside it was still dark and foggy and he was exhausted after working through the night on an etching for a London newspaper. “I went to bed with my clothes on so I could cook you a breakfast,” replied little Kate Greenaway. As she prepared the meal, she asked her father about the work he had been doing. Someday she hoped to be an artist like him and these early morning breakfasts with her father – just the two of them together – were the highlights of her childhood. This harsh criticism did not deter Kate. She was confident she could draw and write and in her spare time she produced a book of children’s poems. The publisher who saw it was delighted. Until then children’s books had been very crude, but Kate brought real art into her work and this was proved by the fact her pictures were later hung in the Royal Academy. The book sold faster than the presses could print it. Kate’s pictures of children in it enchanted adults as much as the young readers. Kate used real children to base her pictures on, while the backgrounds were built on experiences from her own happy childhood. After this success in 1879 Kate was able to give up the Christmas cards and concentrate on more book illustration. These books caused a revolution in publishing for children and many other artists tried to copy Kate’s style. They never quite succeeded and the Kate Greenaway books became so popular round the world that Victorian fashions in children’s clothes were based on them. 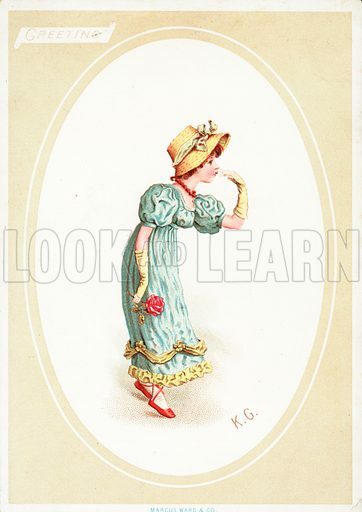 Generations of little girls wore “Kate Greenaway frocks,” even in Japan where the books were translated. All through her busy life Kate continued to capture the happiness of children in her delicate drawings. She died on 6th November, 1901, but since then her work has been reissued and still continues to give pleasure.